And Here We Go! 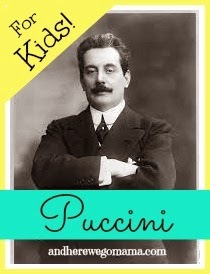 : Puccini For Kids! 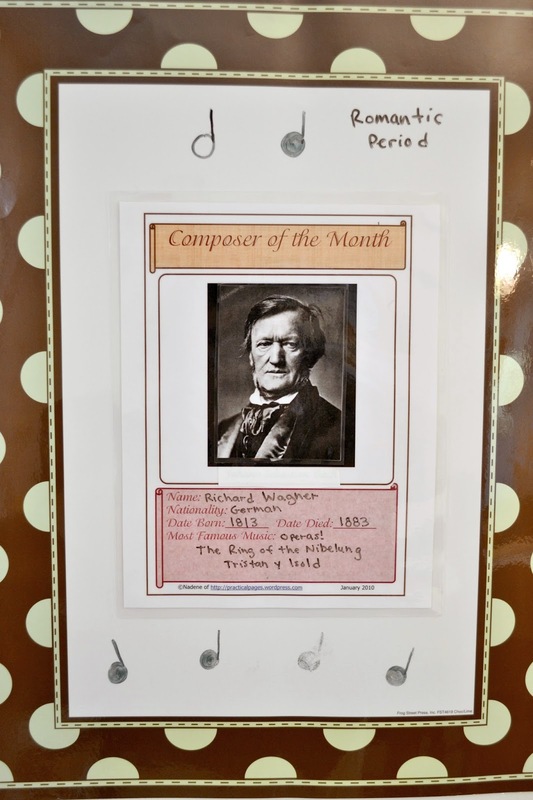 Have you wanted to start a 'Composer of the Month' study but don't know where to begin? Are you interested in opera or want your children to be? If so, I'd love for you to join us as we study Puccini in April! I'm going to show you exactly how I'll prepare and what we'll do at home, and if you'd like to give it a shot, go for it! I've chosen Puccini for our Composer of the Month for April because the Metropolitan Opera is doing his La Boheme next month. The opera will be broadcast into theaters across the country, including our local movie theater! It's always more fun to study a composer when you know you're going to get to see his work up close and personal (even if it's in a movie theater instead of a concert hall). Click here to get tickets! The encore performance used to be cheaper, I thought, but now the live show and the encore are the same price, and it's not cheap. Yes, that's a bummer, but to me, it's worth the $50 (for two tickets) for Mary to actually see and experience the opera instead of just read about it at home. And seeing it in the theater is really very exciting! They have people that go backstage during the intermission and interview the artists, too. The last ones we saw were really awesome! Let me stop for a moment. I should say here that maybe opera isn't your thing. Maybe you think children shouldn't see the adult content in operas. I mean, like, people die ALL the time in operas, and they generally (okay, always) kiss before they're married, too (something we talk to our girls about quite a bit). There's a lot of crazy stuff going on in operas that many people don't want their children exposed to. I totally get that, I do. However, many characters also pray to God during hard times, and generally the bad characters are punished in some way. But, no worries if this just isn't your thing. Also, if your child isn't interested in opera, I wouldn't push it. If you want him to learn to enjoy the music, maybe you could just play it softly in the background throughout your day (more about this at the end of this post). No need to tell him the stories behind them or give him a composer's bio. Just have it floating in the air. And if YOU don't enjoy it, girl, don't even do that unless you're willing to learn to enjoy the music yourself. Your kids will get excited about what YOU get excited about (from my experience at least). Okay, let's get back to Puccini! So, that's why I picked Pucinni for April (bc of the Met's production). Now I'm going to share exactly what we'll be doing throughout the month to learn more about this successful composer and his work. First, I'll update our Composer of the Month chart in the dining room with Puccini's picture and stats. This is our current chart with Wagner. Click here to get your own for free! It has a music box inside that plays O mio babbino caro! Mary adores 'huggable-loveables', as she calls stuffed animals, so I know this will get her super-excited about spending time with Puccini this month. Then I'll print out and read this biography from Classics for Kids. 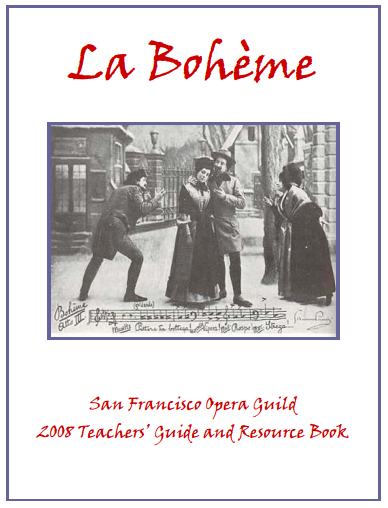 I'll also print out this LaBoheme Teacher'sGuide and Resource Book from the San Francisco Opera Guild. It has a GREAT Puccini bio and TONS of other goodies about him, his famous opera, and opera in general. So good, so good, so good! The Kentucky Opera also has a great resource guide with plenty of interesting background information on Puccini and his contemporaries, as well as what to listen for in each act! We'll play the game where I have Puccini's card and all of his opera cards on the table. Then she'll close her eyes and I'll remove one. She'll open her eyes and try to remember which one is missing. This is quick, fun, and effective in getting her to memorize the names of his most important operas. We'll play this game throughout the month. Click here to get your free opera cards! The Bear Who Loved Puccini is such a sweet, warm-hearted story about a bear following his dream to become an opera singer. Warning: this book contains lots of warm fuzzies and is perfect for little ones! All of the books I've read by Monica E. Lapenta of Babetta's World have just been so lovely. The operas have adult content, but are retold for children in a tasteful way. I plan to post a more detailed book review and an interview with Mrs. Lapenta soon! 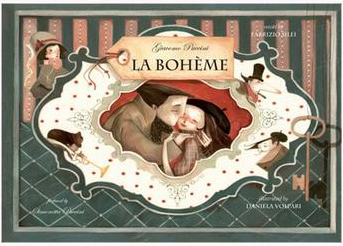 Operas For Children - La Boheme like you've never seen it... from Babetta World on Vimeo. As with all books for your kiddos, you'll want to pre-read and make sure everything is acceptable for your family's values and for the ages of your children. For instance, Madama Butterfly kills herself at the end, and Mimi from La Boheme dies. These unfortunate events have sparked great discussions between Mary and me, but maybe it's not something you'd like to get into with your kids. And then again, maybe it is. I just want to be sure you have all the information before jumping on my Puccini (and opera) bandwagon. La Boheme is considered by some experts to be the greatest opera ever written! This month, we'll focus on that opera (since it's off-the-charts on the awesome scale, and we'll get a chance to see it) and Madama Butterfly, which is another Puccini classic. 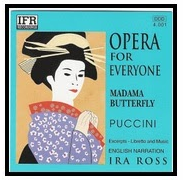 The late Dr. Ira Ross does a fantastic job of narrating the opera; we just LOVE all of these free recordings (it took him almost a year to make each one - wow!). Click here to learn more about them. 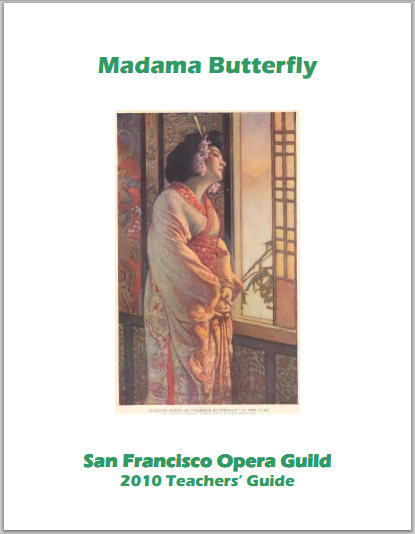 For a little more background information, I may print out San Francisco Opera Guild's Teacher'sGuide for Madama Butterfly. It probably won't be necessary with Mary right now, but when she's older, and if you have older children, this looks like it would be very valuable in helping to understand the opera. And, of course, we'll listen to some music! Che Gelida Manina is perhaps the most well-known aria in La Boheme. This video has English subtitles. This is the film version of La Boheme, sung in Italian. Un Bel Di Vedremo is probably the most well-known aria from Madama Butterfly. Anna Netrebko, our favorite opera singer (she's also Mimi in the La Boheme film above; she's amazing! ), performs the song in this video. 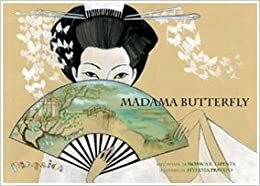 This is the movie of Madama Butterfly with English subtitles. So, there you have it. These are my plans for our April Composer of the Month. It's a very relaxed thing at our house with lots of reading and listening. My goal is to get Mary to simply enjoy the music. I want her to develop an appetite for beautiful music that she can internalize and carry with her as she grows - music that she'll learn to appreciate in various ways in different stages of her life. If this seems boring or crazy to you, I used to be in the same boat, friend. I don't remember being exposed to opera or classical music growing up; I just listened to whatever was on the radio. It's been hard for me to enjoy this kind of music, but I have learned how because I believe it's important. And how do I do it? It's as easy as that (although it's much harder than it sounds, right. I've given up listening to talk radio in the car so my kids can get their opera and classical music in for the day. That was VERY hard, I must admit.). For me, to enjoy a piece of music, I usually have to become familiar with it. So, if you'd like to give this crazy Composer of the Month idea a try, just start playing the music. Start with the most well-known arias from the most well-known operas (if it's an opera composer, as is the case for Puccini), and play them over and over. So, now that you know what I'm planning to do next month, I'd love for you to join me! You still have a couple weeks left to get everything ready to go and download your music. What do you say? Oh, and by the way, I know opera isn't a flashy or attention-grabbing topic (although it totally used to be back in the day! ), so thank you for taking the time to read this entire post. You are awesome, and I appreciate your time and friendship. This post contains affiliate links. Thanks for your support. I received complementary copies of the Madama Butterfly and La Boheme books in exchange for an honest review. All opinions expressed are my own. Thank you for reading the fine print! Can't wait to hear about your first opera experience! Yay! I think it's great that you are walking up through this. I know nothing about opera, but my kids do enjoy classical music, so maybe they would enjoy this too! I'm going to watch on of the videos you linked to now. Thanks for all the great info! Opera is cray-cray sometimes, but that's what makes it fun! I hope you enjoyed the video! Melody, I really love this. Opera is so daunting to people, and it really shouldn't be. It's just stories in music - and most of them are really awesome stories at that! Thanks for so much information in this post! Love this - I just pinned it!